A delightful contribution from a guest author. Dear readers, from time to time I am approached by other authors who have flattered me by asking if I would like to publish their Blog posts from time to time. So I have been doubly flattered by having two authors contact me in the last week. Is this what dogs think? Or do they experience more complex thoughts? Apparently science is getting pretty close to figuring it out. If not exactly WHAT they’re thinking, then where in the brain the thoughts are coming from. Since brains are pretty much the same across mammal species, if researchers identify which parts of the the brain light up, based on what humans have said, they can guess what the dogs’ thoughts are, too. A couple of smart guys, Gregory Berns and Andrew Brooks of Emory University, watching a military dog assist Navy Seals as they overran the Osama Bin Laden compound, got a brilliant idea. If you can teach dogs to jump out of helicopters, surely dogs could be trained to enjoy themselves inside an fMRI machine while scientists calculate what the dogs are thinking by scanning their brains. 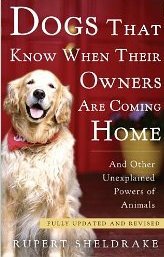 So they recruited a professional dog trainer, Mark Spivak, and two companion dogs, a Feist Terrier named Callie and a Border Collie named McKenzie. The team said that both dogs were trained over several months to walk into an fMRI scanner and hold completely still while researchers measured their brain activity. includes, from left, Andrew Brooks, Gregory Berns and Mark Spivak. 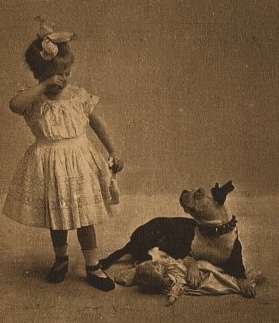 Because of dogs’ prolonged evolution with humans, many of the canine cognitive skills are thought to represent a selection of traits that make dogs particularly sensitive to human cues. But how does the dog mind actually work? To develop a methodology to answer this question, we trained two dogs to remain motionless for the duration required to collect quality fMRI images by using positive reinforcement without sedation or physical restraints. The task was designed to determine which brain circuits differentially respond to human hand signals denoting the presence or absence of a food reward. 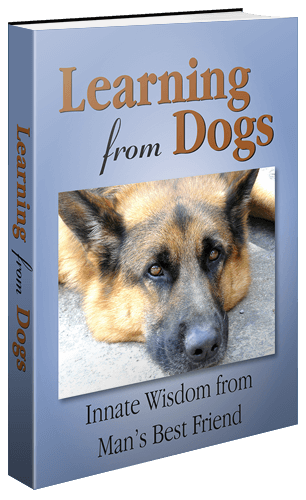 You can read a brief summary of the project here: What is Your Dog Thinking? Brain Scans Unleash Canine Secrets. 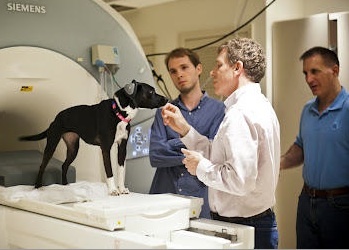 Berns, Gregory, Brooks, Andrew and Spivak, Mark, Functional MRI in Awake Unrestrained Dogs (April 27, 2012). Well, I don’t know about you but I found this a most fascinating article. All of us who live around dogs, both physically and emotionally, sense the closeness, may I use the word ‘magic’, of the relationships. Take a look at the photograph below. Until I left the UK in 2008, a few of us owned a lovely old Piper Super Cub. It was a joy to fly. 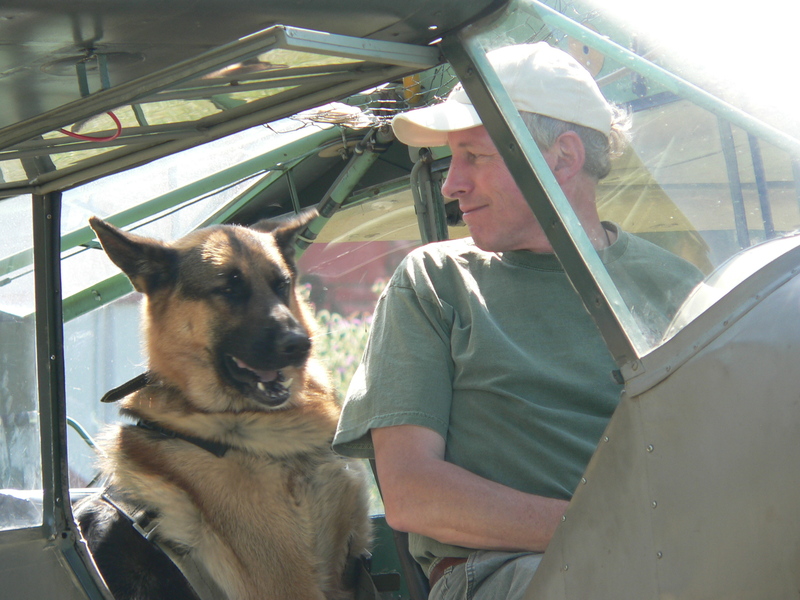 I used frequently to take Pharaoh to the grass airfield, Watchford Farm, up on the Devon moors. One day he showed such interest in the aircraft that I lifted him up to the passenger’s seat, strapped him in and taxied all over the grass airfield. This picture shows something that is difficult to explain otherwise – Pharaoh’s real joy at sharing the adventure. Of course, I didn’t fly with him, that would have been a step too far, but we did taxi almost up to take-off speed. Dr. Barkman, what do you make of that? Watchford Farm, Devon, July 2006.